BT will offer Freeview users free-to-air access to two European football fixtures in early April, plus another game from the Aviva Rugby Premiership. But the telecoms giant continues to face criticism for continuing to avoid English football sides live on a free-to-air basis. BT Showcase on Freeview channel 59 will show live coverage of the top two sides in La Liga: Athletico Madrid is live from 7:45pm on Tuesday 5th April. The quarter-final between Paris St Germain and Man City on Wednesday will be on pay TV only. Then on Thursday 7th April, the channel will show first leg quarter-final action from the Europa League, with action from the fixture between Athletic Bilbao and Sevilla from 8:05pm. Dortmund v Liverpool will be on pay TV only. Additionally, At 3pm on Saturday 16th April, BT Showcase will show another free-to-air Aviva Premiership Rugby fixture, featuring Saracens v Harlequins live from the Allianz Arena. "Once again Freeview viewers can see some of the best players in the world compete in the UEFA Champions League and Europa League on BT Sport Showcase... It's great to be able to give Freeview viewers the opportunity to experience BT Sport's exclusively live coverage on BT Sport Showcase." BT promised to show each British side in the Champions and Europa League at least once per season on a free-to-air basis, which it subsequently did early in the season. The omission of English sides in recent months has triggered a steady flow of complaints on social media and internet forums about the level of coverage, compared to the high profile coverage once available on ITV. 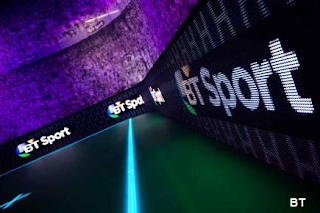 In February, The Telegraph reported that BT was forced to offer free-to-air coverage, offering a "half hearted" approach to free coverage, with other sources confirming the coverage is the bare minimum required as part of the rights deal with UEFA. BT's free-to-air football isn't available to viewers with Sky, who need to sign up to BT Sport to access all the games. Virgin Media viewers can access the free-to-air coverage via a special service that appears on channel 548.